The purpose of this section is to give an overview of the various combinations of equipment that I've used over the years. This to give some insight in how and when most of the equipment listed in the Previous Equipment has been used and what the road to the current setup was. Note that I've tried to make sure that all equipment names mentioned in this story should be clickable to see detailed information for that item. Before using hi-fi separates I was playing my music on a portable stereo radio with a cassette player. The first step forward was a pair of speakers that I got from my brother, the B&O Beovox 1001 speakers. This was around the age or 12/13 or so, so we are talking about 1982/1983. 1987 was a special year for a lot of reasons that I will not discuss here. One of the big changes was that I decided to by a 'real' hi-fi set. This resulted in buying an Akai midiset consisting of an Akai AV-M313L amplifier, Akai HX-M313W Double Cassette deck and a Akai AP-M313 tangial record player. The Akai receiver had some kind of surround mode where it used special Akai surround speakers to create a more open sound. However, I couldn't afford the surround speakers at that time so I used it in plain stereo. The double cassette became heavenly used, and looking back we can conclude that the tangial record player was complete crap (constant problems with the tangial arm). The new Akai setup was combined with the B&O Beovox 1001 speakers that I already had. I was planning to buy Jamo speakers later on but because of the famous cash flow reasons this had to be postponed. The next big step was buying a CD player. And although the matching cd player for my midi set was still available, I decided to go for a Sony. This was based on the assumption that Sony made better cd players than Akai, which was probably true. A year after buying the midi set not only had the cash flow starting to flow again, also the Jamo speakers that I wanted were on sale!! So in came the Jamo Laser Sound speakers. These were 3-way speakers with a plastic covered baffle giving them a somewhat odd look. In a sale at Correct in Rotterdam the Akai AE-S90 surround speakers who were supposed to go with my Akai amplifier were on sale. I can't really say that the made the sound better, more different. 1990 was year of exams and graduation of high school and starting University in Rotterdam. No new equipment, all the stuff just moved to the house in Rotterdam that I shared with my brother. After 4 years of very very heavy use the Akai cassette deck started to give problems. So quickly to Correct to look for a new one. After lots of consideration the Sony TC-K470 was chosen. First of all this was not a double cassette deck anymore (I had decided that copying from tape to tape was not going to happen anymore). Also a big difference was that it was not midi size, the move to full sized equipment had started. The specific model was the cheapest Sony model with a remote control. My brother decided to leave the house which we were sharing. On one side this was a good thing (I had the whole house to myself now), but the bad thing was that he took along his 70cm Grundig Stereo television! Since the only television I had at that time was a 15 year old model that sometimes between all the static showed something of what was actually on tv, it was time for a new television. Working all summer to safe up the trip to Correct was made again. The television of choice became a 70cm Grundig stereo television. There was picture in the house again! Not long after that I also managed to buy a VCR, the JVC HR-D910. So renting movies was now also one of the possibilities. During a not so interesting college at the University a fellow student showed me some magazine from a shop called Elvic. This was the first time I was introduced to laserdiscs, which sounded very interesting to me. Another topic in the magazine was about Dolby Surround. And I remember very well that I said to that fellow student that that was going to be an expensive setup since in my opinion you need the same speakers all around (it would take a lot time before I actually came to that situation). The fellow student said that that was not necessary because the surround speakers only delivered ambient sound (where did we heard that again?). As we say in the Netherlands, the rabbit was out of the hat now. So the next time when I was walking through the 'Koopjeskelder' of Correct again (apparently I found that great entertainment in that period) I bumped into the Pioneer CLD-1400 laserdisc player. The laserdisc player was bought along with my first two Laserdiscs ever, Lethal Weapon 1 and 2 (NL PAL, Pan & Scan). Buying the Laserdisc player also meant that I could start using it as a CD player so my first CD player, the Sony, was sold to a family member. In january a lot of hi-fi shops typically have some sort of sale. So did Correct, and they even had a special sale on Second hand equipment. A lot of the second hand equipment was trash, but somewhere in the back I had noticed the B&W DM220i speakers. This second hand sale was the type of sale that started on a specific day and a specific time. Being a student it was no problem being there on that time, and I bought the B&W DM220i speakers. During the summer a new shop opened in Rotterdam: Rodisc. Having to have to go to either Correct or Elvic for laserdiscs up till that point, this was a dream come true. What also became very clear with the opening of Rodisc was that the number of available laserdiscs (NTSC) in US was many times greater than the titles available in Europe (PAL). So the next target was to replace the Pioneer CLD-1400 PAL-only laserdisc player with a multisystem model. At a given point Rodisc had a second hand Pioneer CLD-1750 for sale. So out went the Pioneer CLD-1400 and in came the Pioneer CLD-1750. B&W announced at the end of 1993 a a smaller version of their Solid speaker, the B&W Solid Team. This was a small magnetically shielded two-way speakers that looked like a perfect replacement for the Wharfedales as center speakers. So, the speakers were ordered (they were so brand new that the store didn't even had heard of it yet and they just ordered them based on my description). They arrived and thus the B&O speakers were put at rest again and the Wharfdale Delta 30 speakers became the surround speakers. Now playing with the Pioneer CLD-1750 laserdisc player, I discovered that my Grundig television didn't do very well with NTSC (actually it didn't support NTSC, only pseudo-pal). My parents agreed on swapping televisions, they had bought a Blaupunkt TV that they had for a year now. The Blaupunkt did support NTSC, so that was already an improvement. Apart from that these TV's were very similar, that's why my parent didn't really care. However after some time I still wasn't very happy with the picture. So it was decided to buy a pure NTSC LD player and a pure PAL LD player. These became the Panasonic LX-900U and the Philips CDV495. The Blaupunkt television had a special cabinet below it where you could fit a videoplayer. I decided that this would be nice to put a center speaker in there, so I bought a Yamaha NS-C60 center speaker. This speaker fitted indeed nicely into this space for the VCR. The B&W Solid Team now became the surround speakers and the Wharfdale Delta 30 speakers were sold. Not being very happy with the sound of the LD players when it came to playing CD's someone pointed me into the direction of using an external DA converter. After some looking around this became the Audio Alchemy DAC in the box. A small machine with both a COAX and an Optical digital input. This way both LD players could be connected to it. The end of year sale made for a big upgrade again. The Yamaha DSP-A500 was replaced by a Yamaha DSP-A970. This Yamaha DSP-A970 was almost the top model from Yamaha at that time. Biggest improvement was more power on all channels. Even after switching television and LD players, I still wasn't happy with the picture quality. At the end of January a big electronics shop had a 70cm Sony TV on sale. After visiting the shop, going through all the options I ended up with a far more expensive model which was twice the price of the model on sale. I now had a 70cm Sony KV-E2941D TV with detachable speakers (once detached, never used again), picture-in-picture, 3 scart connections and so on. And it had the most beautiful picture both on NTSC and PAL, finally I was happy with the picture! Pioneer had released a new LD player, the Pioneer CLD-2950. 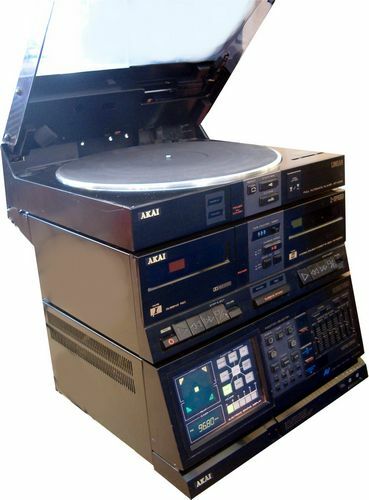 This machine had everything that you could wish for on a LD player at that time, including the option to play laservision discs, high speed auto reverse, independent CD tray with CD direct and more. So the decision was made to replace the Panasonic LX-900U and Philips CDV495 with this machine. Some speaker changes followed. A hi-fi shop in Rotterdam had a second hand B&W DM600 IFS for sale. The B&W 2000IFS was replaced by this speaker. Not too long after that I got the change to buy a pair of JBL HT1D surround speakers. These speakers were typically only sold in a complete surround speaker package, but this person had gotten hold of only the surrounds. The B&W Solid Team speakers I had used up until that moment for the surrounds were now being used as front effect speakers (some special Yamaha thingy). The Audio Alchemy DAC in the box got replaced by the Denon DA-500 DA converter. This converter got good reviews at that time, and what I also liked was the fact that it had a full size case making it easier to place in the audio rack. The opportunity to buy a demo Rotel 985MK2 allowed me to experiment a bit with an separate power amplifier. In combination with the Yamaha DSP-A970 this was not completely ideal because the Yamaha didn't have pre-outs for the main channels, only for surround and center. The year of the big changes. I had come to the conclusion that I would like to add a subwoofer to my setup. The plan was to buy a Rel Strata subwoofer. Talking this over with a couple of hi-fi friends, one of them said: "You can buy my speakers for the same price that the Strata would cost and then you don't need a subwoofer anymore". So the deal was made for buying the OLS Lotus 1 speakers. This triggered a whole chain of events. It was immediately clear that the Yamaha would have a hard time feeding these speakers, so it was decided to switch the Yamaha DSP-A970 for a Yamaha DSP-A2070 (the top model at that time, with pre-outs for all channels). Also instead of using the Rotel 985MK2 I also bought the Arcam 120.2 from the same guy I bought the speakers from. He had used two Arcam power amps in bi-amping, he kept one. So I now used a single Arcam for the front channels. A good friend had the Pioneer SD-M1407 projection television. I always liked it very much but he still wasn't happy with some aspects of it. So he asked if I was interested in buying it. We reached an agreement, but with that agreement we also agreed that I was also buying his Vifa Center speaker. This center speaker was a custom made center speaker firstly to match the Vifa Basis 95 speakers that he was using and secondly to exactly fit under the Pioneer television. A quiet year for a change. I bought the Sony DTC-690 DAT recorder to be able to record CD's in a high quality manner. The rest of the year was focused on finishing University, which I did. Yamaha released the DSP-A1 as their new flag ship. I managed to lay my hands on one of the special edition items, champagne color with wooden side panels. After only having Dolby Pro-Logic up till now, I now entered the world of DTS and Dolby Digital. Well the world of DTS only for the time being. The Pioneer CLD-2950 didn't have a RF out connection to be able to use Dolby Digital LD's. The Pioneer CLD-2950 was replaced by the Pioneer DVL-909. So not only I could now play my Dolby Digital Laserdiscs, but I could also play DVD's! While visiting Baarn I spotted an Arcam 120.2 in the shopping window of Pol Audio. I think I needed something like 20 seconds for deciding to buy it. At that time the 120.2 was not made anymore and I was still looking for one to bi-amp my front channels. The Arcam 120.2 was a very convenient poweramp for bi-amping because it had a switch putting it in bi-amp mode in which way you would only need 1 interlink. When I arrived at home and connected everything I noticed that the new amplifier was playing much quieter than the old one, which in bi-amping gives a not so nice result. So let's make a phone call with Pol Audio. The shop owner said that he had already noticed that the amp was not as powerful as he had expected. The Arcam 120.2 was known to be quite powerful. He arranged that I could drop the amp at Audiac for repair and that he would pay for it, excellent service! On top of that Audiac asked for also bring in the second amplifier so that they could make sure that they were perfectly matched for my bi-amping setup, again excellent service! For the new amplifier it was discovered that the previous owner had made some mods to probably get the gain down. This was removed after which the amp was perfect again. At the end of the year I even managed to lay my hands on Arcam 120, the precessor of the Arcam 120.2 with small differences. I was planning to use this one for the surround channels. It turned out to be going only very shortly used. I now had a surround amplifier and 3 power amps. A couple things started to bother me. First of all the Yamaha DSP-A1 was the flag ship model when I bought it, it was now already been followed up with the Yamaha DSP-AX1. This to me started to look like an endless game. The second thing was that I had a full blown surround amplifier but I didn't really use the power amps in it at all. SO the plan was to start look for a processor that somehow was going to be more future proof. After some research I had come to the conclusion that the Tag McLaren AV32R was a perfect candidate, but boy that would require some serious saving. Well sometimes you've got to have some luck in life. First I received some extra bonus from my employer, secondly someone offered the Tag McLaren AV32R and Tag McLaren 100X5R for sale. I was initially only interested in the processor. I asked to person if he would consider buying it separately. He agreed on that under the restriction that he would first also find someone to buy the power amp, but he wasn't expected too much issues in that area. I went to his house to audition the setup, and boy that blew me away! After a month or so he still hadn't found someone for buying the power amp. I was still impressed by the combination, so I made him an offer for both the Tag McLaren AV32R and Tag McLaren 100X5R. He accepted and I was the new proud owner. During this time we were also moving house and I decided that it was time to say goodbye to some of the hardware. The Sony TC-K470 cassette deck, Sony DTC-690 DAT recorder and JVC HR-D910 VCR were hardly used anymore, so they had to go. Also I now had three Arcam poweramps not used anymore, so they were sold. Finally because of the excellent DACs in the Tag McLaren AV32R I could also sell the Denon DA-500. Also since the Tag didn't have the front effect option of the Yamaha, I could also sell the B&W Solid Team speakers. Moving to the new house also posed a new challenge. The JBL HT1D surround speakers I was using were the type of speakers that you were supposed to hang on the wall. In the new house this didn't really fit, a pair of standing speakers would be far more appropriate here. This is now an almost famous story. At that point I suggested to buy a pair of small standing speakers for surround. My girlfriend didn't like that idea at all. So I asked her, why? She told me that she was afraid that when we would buy those small standing speakers that she would accidentally bump in to them or something and that they would tip over. So her suggestion was to buy similar speakers to the front speakers, well that's my kind of girl! There was no change that I would ever find another pair of OLS Lotus 1 speakers, so I bought the closest match: Vifa Basis 95 2.0. These speakers are more or less the same design. Charles van Oosterum has first designed the Vifa Basis 95 2.0, where the objective was high quality but for an affordable price. He then further developed this design for his own company what then became the OLS Lotus 1, which was the no compromise version. With the processor and poweramps seriously upgraded it became clear that the Pioneer DVL-909 wasn't the best DVD player in the world and definitely not the best CD transport in the world. So in search of a DVD player that could also double as a reasonably good CD transport the T+A DVD 1210R was bought. An absolute improvement over the Pioneer DVL-909 and a nice design that fitted perfectly with the Tag equipment. Part of the reason for buying it was also the fact that I had started to replace all my laserdiscs with DVD's, so that in time I could sell the Pioneer DVL-909. Early 2002 an upgrade for the Tag McLaren AV32R became available, new 192Khz DA converters and a 5.1 bypass. So the Tag was shipped to the U.K. for the upgrade. I also had it upgraded from 5.1 to 7.1 at the same time, saving me some cost of sending it twice. The new DACs turned out to be a very nice improvement. Also getting your machine back after the upgrade you really had the idea that it was new again, all cleaned up and everything. The Pioneer SD-M1407 television started to show its age. The image got darker and started to give some strange colorations here and there. My girlfriend had already asked me once if there were also bigger televisions for sale. So it was quickly decided that it had to be a 50 inch television. Given the prices for plasma's it was also quickly decided that it had to be a projection television again. The choice became the Toshiba 50VJ23P. One of the reasons was also that the Toshiba had a component input and I was definitely thinking about a DVD player with component output. The TV was ISF calibrated by Frank Doorhof. It was early January when I picked up my new DVD player, the Tag McLaren DVD32FLR. The Tag McLaren 100X5R was doing its job pretty well, but I had the feeling that a bit more power/control on the front channels wouldn't hurt. So keeping an eye open for something nice to come along I noticed the Burmester 911 MK2 being offered second-hand on hifi.nl. I had only heard Burmester equipment once before but was very impressed with it. I went to audition the Burmester and after some hard thinking decided on buying it. At the end of 2003 I had noticed that someone offered a pair of Avalon Eclipse speakers for sale on hifi.nl for a reasonable price. After some consideration I went to have a listen at them. I was immediately sold, so I had a pair of front speakers now. But now also the 4G rule was about to be broken. And with the biggest luck someone can ever have, a second pair of Avalon Eclipse speakers were being offered second-hand, in exactly the same color! I directly contacted the guy and also bought the second pair of speakers. I sold the OLS Lotus 1 speakers, the two pairs of Vifa Basis 95 2.0 and Vifa Center and was now playing in a 4.0 setup. A bit of luck on eBay also made for a Tag McLaren T20 tuner, which was added to the setup. Initially I had planned to combine the Avalon Eclipse speakers with an Avalon Symbol Center speaker. But after listened to that center speaker I decided against it. So I was now in the situation that I was playing in a 4.0 setup with the Burmester 911 MK2 amp for the front speakers and the Tag McLaren 100X5R, only using 2 of the 5 channels of that last one. Not making full use of the Tag McLaren 100X5R I decided to sell it and to hunt for a second Burmester 911 MK2. That succeeded, a Burmester dealer in Munich had a second-hand one for sale. The moment I contacted him to ask if it was still available he immediately discounted the amplifier with 500 euro, so a deal was quickly made. Now we were closer to 4G again. In parallel I also had gotten hold upon a Tag McLaren Aphrodite on eBay, directly followed by a pair of + Tag McLaren Calliope speakers to accompany it. But when the Aphrodite arrived it turned out to have some problems. After it had been on repair for a couple of months I got my money back, now being left with a pair of Tag McLaren Calliope speakers not being used. I had to chance to play around with a SACD player from a friend for some time at my home. I liked this so much that I started to look out for a Sony SCD-XA777ES SACD player. When one came along second-hand the decision was quickly made. However this was a short experience. The way how this player handled stereo SACD's compared to multi-channel ones in combination with the Tag McLaren AV32R made that I quickly sold it again. Because of the experiences with the Sony SCD-XA777ES I looked into buying a multi format player to replace the Tag McLaren DVD32FLR. In the end it was decided that it was better to keep the Tag McLaren DVD32FLR and to combine it with a separate SACD player. Because of this I switched around my Tag McLaren DVD32FLR for one which had the PSM192, progressive scan, card fitted. With the sale of the Tag McLaren company to IAG a lot of the Tag equipment was sold at very low prices. Because of that I decided to replace my Tag McLaren AV32R SP with a Tag McLaren AV32R DP. TMREQ was now one of the options. The release of Jeff Wayne's War of the Worlds on SACD was the trigger for me to actively start looking for a SACD player again, this became the Sony SCD-XA333ES. This player has been modified by Sound Evolution, the modification report can be read here. After long and hard thinking and reasoning it has been decided to sell the Tag McLaren DVD32FLR and to buy a Tag McLaren DVD32R. June 2006, lots of changes. The move to the new house has taken place which has led to a couple of changes. Both of the Solidsteel racks have been replaced by a Creaktiv Little Reference rack. Also the Toshiba projection television is sold. As a replacement I've bought a Samsung LE-26R73BD LCD television. This LCD television will be used for watching 'normal' television, for movies projection is the new target. For the projection part a scaler, the Crystalio VPS-2300, is bought. Also an Adeo Tensio (tabtensioned) projection screen is bought. Both items were bought at ITC. For a projector I'm waiting for the availability of more HD projectors somewhere later this year. For the time being I've got a NEC projector on loan, so that I at least can watch movies. March 2007. After a period of relative silence some updates again. For mostly convenience reasons, it is decided that I won't pursue the projection plans. The Adeo projection screen has been put up for sale. Also, I've decided to jump on the HD bandwagon. I've bought a Toshiba HD-XE1 HD DVD player. So now it is time to start collecting HD DVD's! Also, I've ordered a Velodyne DD-12 subwoofer. This has been long planned for. Because I didn't want a black one, but a silver colored instead it is going to take around 3 to 4 months before it will get delivered. June 2007, the projection screen is sold and the new replacement a 52" Full HD Sharp LC-52XD1E is bought. A Supra HDMI cable will connect the Toshiba HD DVD player to this new television. A beautiful 1080p picture is the result. July 2007. Bjorn of Beter Beeld & Geluid has come along to install the new Velodyne DD-12 subwoofer, very nice! Because the subwoofer needs some decent power also an Isotek Multiway has been bought. A Shunyata Taipan Alpha connects the Multiway with power socket. The SideWinder Gold from the Burmester 911 is now going to be used for the Velodyne DD-12. For the Burmester 911 a second Shunyata Mojave has been bought. Januari 2008. It looks like that the HD format war has been decided. Blu-ray is the way forward. Based on that I've decided to sell the Tag McLaren DVD32R. Initially, I already had a Pioneer BDP-LX70A on order, but after I discovered that this is really nothing more than a Sony BDP-S500B with a different analog section I cancelled the order again. In March I bought a Van Medevoort CT333 CD transport. Since selling the Tag McLaren DVD32R, I was using the Sony SCD-XA333ES as CD transport. But the Sony is somewhat picky with CD recordables and also the transport is quite noisy (mechanically) with CDs. Juli 2008. A Panasonic DMP-BD30 is bought for playing Blu-ray discs. The player has been made region switchable so that it can also play US discs. At the end of the summer the Van Medevoort CT333 is replaced by the Micromega Duo CD 2. A beautiful top loader CD transport. HD DVD is dead, so the the HD DVD collection and the Toshiba HD-XE1 are sold. It is Blu-ray only from now on. In June the television is replaced by a Samsung UE55B7020. Which is now placed on a Screentech ST750 TV Lift. This also made the Isotek Multiway obsolete, so that one has left the building. I was looking for a long time for a candidate to replace the Panasonic DMP-BD30 for something more serious. For a long time I had my hopes set on the Denon DVD-A1UDCI. But delays and the uncertainty for getting it in a region- and zone-free version made me look around for something else. I noticed that the Oppo BDP-83 Special Edition was released which should give an performance gain when it came to sound over the standard Oppo BDP-83 and was available in regio free. While searching for a place to buy this player I stumbled on the Oppo BDP-83 SE NuForce Edition which promised to deliver an even better sound. So I ordered this one. However after 2 weeks I deceided to replace it with the Oppo BDP-83 SE NuForce Editon Signature Edition from The Upgrade Company which increases the quality of the player still some more. Peter Gabriel released a new album and announced that next to the CD it would also become available as a 24-bits FLAC download. Until now I had been able to stay away from the whole music streaming thing, but this was a reason to look into this. After some research I decided that the HDI Dune HD Base 3.0 was the best choice. So I bought this one, added a 2Tb HD to it and a D-Link Wireless dongle. I also took the step of moving into the digital tv-era and with this it made sense to start using a hdmi switcher. This way the number of cables running along the TV-lift would be minimized. The Oppo HM-31 became the HDMI switch of choice. The table became a bit cluthered with all the remote controls, so when I had the chance to buy a Philips Pronto TSU9600, I took it. Shortly after that I was thinking about also using the Philips Pronto RFX9600 and with it came also and Philips Pronto TSU9800 that replaced the TSU9600. I quickly discovered that the RFX9600 was a bit too much for my situation and replaced it again with the Philips Pronto RFX9400. However after a while I also didn't see much need for the RFX9400, so that one is also gone. In December the Samsung UE55B7020 is replaced by a Samsung UE65C8700 65" LED television. It wasn't already used anymore for almost a year, so the Micromega Duo CD 2 was sold. Oppo had announced a new more audiophile version of their BD player, the Oppo BDP-95. NuForce had also announced an Extreme Version of this one, so this was the version I wanted. When NuForce announced that they had cancelled the Extreme Edition, due to the fact that they could not improve the base BDP-95, I decided to order the BDP-95 but obviously again in the version of The Upgrade Company. This was around the march time-frame. Buying that BDP-95 triggered a series of events. First of all I ran into a second-hand Linn Kisto. Compared to the Tag McLaren AV32R the Linn gave me a couple of new benefits. First of all I could connect the Burmester 911 amplifiers through balanced interlinks and also the Velodyne DD-12. Also since the Oppo BDP-95 had a balanced stereo output and the Kisto a balanced stereo input there was more improvement to be gained. It was April before the Oppo came in, also around that time the Tag was sold, so by then I actually started to use the Linn Kisto. This has also given me time to buy the needed balanced cables and such. There was a big improvement in the new setup. One of the new benefits of the Oppo BDP-95 was that it could also play flac files from an external hard disc. Until now I had used the Dune Base 3.0 for this. So I decided to sell the Dune. The current setup was now very much such that I used the Oppo to play anything, feed that analog into the Kisto and the Kisto was only used as an analog pre-amp. This started to make me think why use a Digital Surround Processor that can do massive amount of things and only use it as an analog pre-amp? Maybe I should then just look at a purely analog pre-amp, and there was one that I already had an eye on for a long time, the Audio Research MP1. Some research revealed that I had to decide quickly on this one because ARC was going to discontinue it. So decision made and and the end of June the ARC came in and the Linn Kisto was sold again. Soon after I've replaced the Akai television with a Samsung UE22D5010 Full HD LED television. Although everything was working perfectly in the fitness room, the fact that the Panasonic DMP-BD30 took so long to startup was annoying me. So I replaced is with an Oppo BDP-83. Having had the Oppo BDP-83SE NuForce in the past, I knew the sound of the SE was a big improvement over the standard BDP-83. So when I had the option to buy an Oppo BDP-83SE at the end of 2012, it quickly replaced the BDP-83. Sometimes the changes go very quickly. Only weeks after the Oppo BDP-83SE had taken its place in the second setup, a Oppo BDP-83SE NuForce was put up for sale. So it was back to to the NuForce edition again. In the main setup I'm using the Oppo BDP-95 as streamer for all my music, this is something that the Oppo BDP-83SE NuForce in the second setup could not do. Spending more and more time with the second setup I decided I wanted a solution for this. This came in the form of a Bluesound Node. At the end of the year this was extended with a NAS where both the Oppo and the Bluesound connect to, with the use of Audioquest Forest ethernet cables. Although there is a lot of stuff that the Oppo BDP-95 does very well, one thing kept annoying me. It doesn't play flac files gappless, which is very annoying with concept albums (for example Marillion - Misplaced Childhood). So for a certain amount of time I've been trying to find a Linn Akurate. At a certain point Bjorn, of Beter Beeld & Geluid, that they had both the old and the new model of the Akurate available and if I wanted to have a listen to compare. I did listen to the two and suprisingly my conclusion was that I actually liked the Akurate DS/0 (the old model) better than the Akurate DS/1 (the new model). So that one was taken home. I also decided to upgrade the television with a Samsung UE75hu7500 75" UHD television. Opportunity knocked when a Linn Klimax Renew DS was offered for sale and the person was willing to trade in my Akurate DS. The Goldkabel Powerline Flex got replaced with a PS Audio Dectet. Halfway the year Audioquest introduced the Jitterbug, a USB Data & Power Noise Filter. A decided to give them a go and ordered 5 of them. I have connected them to the NAS, Router and the Oppo BDP-95. In the sound you notice that everything becomes a bit cleaner, more defined. I tend to compare it to what Tag McLaren did with their T2Link between the DVD transports and the pre-amplifier. The effects are comparable. Although there was nothing wrong with the Bluesound Node, the fact that a Linn Majik DS was offered for a nice price made me decide to replace them. It does give you the benefit that you only need a single app on your phone/table to control both streamers in the house now. Doing some videostreaming I discovered that the Oppo BDP-83SE NuForce in the second setup was not doing this as well as the Oppo BDP-95 in the main setup. With that in mind and also expecting that 4K Blu-ray will happen soon I've replaced the Oppo BDP-83SE NuForce in the second setup with a Dune HD Smart H1 for the time being. I had my doubts about the PS Audio Dectet that I had bought last year. After some research I've replaced it with a Vibex Reference power block and a PS Audio Power Plant 3 powering the pre-amp, Oppo and Television. Early in the year the Oppo UDP-205 was announced. I decided that I wanted it in the CineMike version. Between it getting announced, it actually being available and the CineMike modification being available, quite some time was gone. But finally in August it got delivered. What are you going to buy when you already have everything? Well apparently an audiophile NAS, in my case the Melco Audio N1ZH/2. 6Tb of storage specifically build for audio usage. On top of this Minimserver is running, the same that I used before on my normal NAS.